Once you have defined the general information for a well (see Creating a New Well), you can add the markers. For more information on the format of a marker file, see Import Formats (Well). 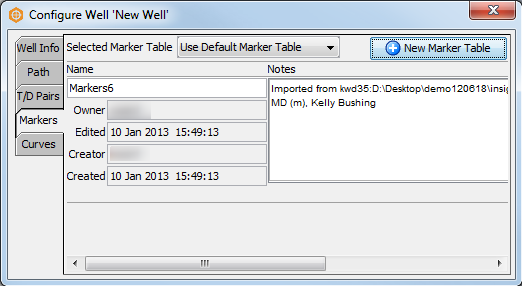 Note: To view and edit the markers data in a spreadsheet (Well Markers Table), see Working with Well Markers and Tops. Open the Markers tab in the Configure Well window. This window is displayed once you have saved the general well information. In addition, you can also open this window by going to the Well tab in the Control Panel, right-click at the well item and click Configure Well 'WellName'. Open the Markers tab. Click New Marker Table to add a new marker table for the well. The Add New Marker Table window will be displayed. 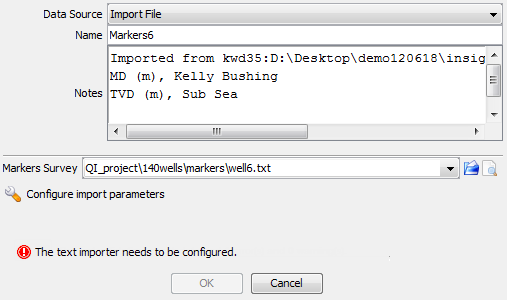 At Data Source, select Import File to import a marker file, Copy Existing to copy from an existing marker file you have imported previously or New (Empty) if the well does not have markers. 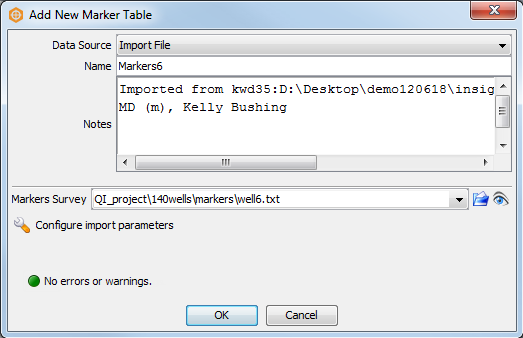 In this example, a marker file will be imported. At Name, type a name for the markers. If you do not type a name, Insight will enter the name of the marker file you import. Type any additional information about the markers in Notes. At Markers survey, click the Select File icon. Select the markers survey file for the well and click Open. By default, information of the selected file will be displayed in Notes. Click the Preview the file icon to view the file content. As you enter the information of the well path, you will be notified if there is any error or warning. The icon will turn green if there are no errors/warnings. 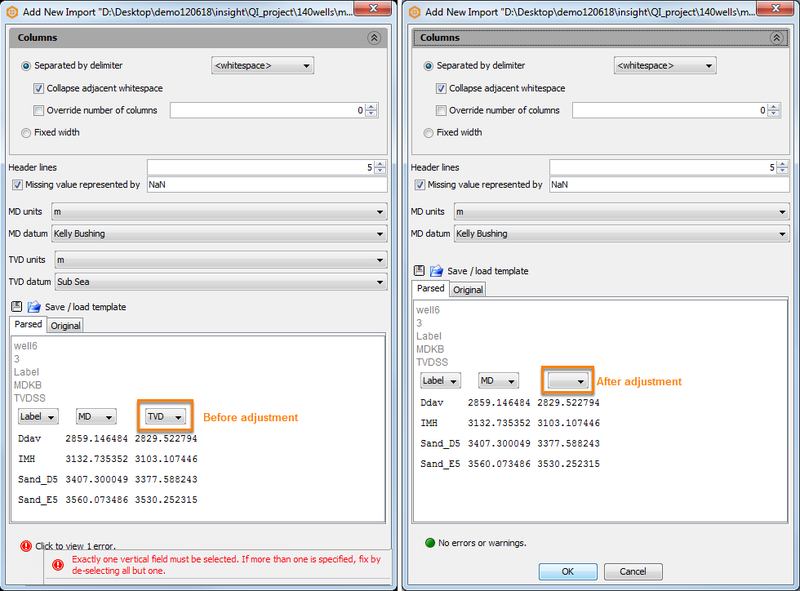 In this example, an error is detected and you need to configure the text importer. See if there is any error/warning indication at the bottom of the window. Adjust the text importer accordingly. In the example, you should only specify one vertical field. Hence, click the "TVD" column header and leave it blank. Once it is error-free, click OK.
Once you have added a marker survey file and configured the import parameters, check if there is any more error or warning. Click the exclamation icon to see the details of the errors/warnings. The icon will turn green if there are no errors/warnings. To view and edit the markers data in a spreadsheet (Well Markers Table), see Opening Marker Classification Sheet. To edit markers in well correlation, see Edit Markers in Well Correlation.